The news out of Bolivia seems to indicate an improvement of the situation as conflicts between pro-autonomy activists and supporters of the government have moved away from a civil disobedience campaign that morphed into violent resistance in the eastern departments of the so-called Media Luna and towards a negotiated solution through dialog. The talks, which largely resulted from apparent international pressure on Morales from other Latin American leaders at the recent UNASUR (Union of South American Nations) summit, are being mediated by a group of international observers that includes official representatives from the UN, the OAS, and UNASUR; as well as the Catholic Church. As of last Friday, September 19, those brief talks in the Bolivian city of Cochabamba produced no tangible results, though a framework for pursuing a lasting agreement to stabilize the country was reached. A future road map for the process has been laid out in which the two sides agreed to joint participation in three commissions: one to deal with the distribution of the Direct Hydrocarbons Tax revenues to the departments and the support for old age pensions those departments will distribute -- rather than the national government, which was the original complaint of the Media Luna that produced the Paro (general stoppage) protests; a second to legitimize the constitutional validity of the autonomous status of the eastern departments; and a third to reestablish the nomination and approval process to fill vacancies in the judicial branch of the government, especially with reference to the National Electoral Court. Direct talks between the Morales government and the Prefects have ended for the moment, and attention will now turn to the work of the commissions, which is where any agreement that is acceptable to both sides will have to be negotiated. 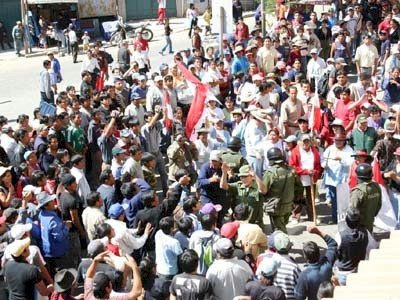 The Paro civil disobedience campaign that began in the third week of August in the five departments of Bolivia's east continued unabated, albeit with steadily-escalating tensions, until the second week of September, when very serious violence erupted in the Department of Pando on Thursday, September 11. According to the first reports from the Santa Cruz, Bolivia newspaper El Deber, at least eight persons died and 39 were injured in what appeared to be something of a scheduled clash between autonomists and MAS activists, though differing versions were offered as to how the violence erupted. President Evo Morales then responded by declaring a state of siege in Pando, which is the Bolivian equivalent of martial law, and ordered in troops from the army, who retook the airport in the departmental capital of Cobija. Control was reasserted in a manner that cannot be described as entirely "peaceful," though again details as to the particulars are difficult to grasp given the conflicting reports circulating from government and pro-autonomy sources. It is known that others died in the violence in Pando, perhaps bringing the total to as many as thirty, and that a refugee problem began to develop as frightened locals fled to Brazil for safety, most fearing retaliation from the MAS, who began to take out their frustrations against many Pandinos after the arrival of the army, according to first-hand accounts taken from refugees in Brazil. The Pando situation was only the worst example of what went wrong with the Paro protest. Before the violence began, numerous recognizable instances of a degenerating situation already indicated events were spinning out of control. Confrontations between protest supporters and MAS activists became increasingly tense everywhere. Pro-autonomy leaders of the civic committees throughout the Gran Chaco region of Bolivia's southeast acted to shut down the country's gas production and exports -- important to Brazil and absolutely vital to Argentina -- when they seized producing fields and closed pipelines and at least one bombing attack on a pipeline caused serious damage. The pro-autonomy seizures of national government offices throughout the Media Luna continued in an ever-escalating upward spiral of confrontation with both police and military units. MAS activists began to undertake their own "counter-encirclements" of several key cities in Bolivia's east, creating what we might describe as a "Paro within a Paro" and which was exactly the kind of confrontation that produced the violence in Pando. There was also evidence that the protest succeeded in creating food and gasoline shortages in Bolivia's western departments, which was the Media Luna's goal from the beginning. La Paz's La Razón newspaper reported meat shortages in the city, where some markets closed altogether and rising prices for meat exemplified the economic effect of scarcity. Gasoline shortages forced the closure of some filling stations there as well, though the shortfall was experienced throughout the country. It would go too far to claim that the Paro achieved its goal through economic pressure, but it cannot be denied that its effects had an impact. With the eruption of violence in Pando making the humanitarian case for action self-evident, though perhaps also influenced by Brazilian anxiety over a developing refugee exodus and larger regional concerns over the possible cessation of Bolivian exports of natural gas, UNASUR President Pro-Tempore Michelle Bachelet of Chile called for an emergency summit to address the crisis on September 13. Ostensibly coming together to show continental support for Morales, which the conferees demonstrated in their public utterances, UNASUR nonetheless produced a result on the ground not in keeping with the entirety of the public posture Morales had maintained within his own country. Though in their public statements the UNASUR members voiced their support for Evo Morales's "plan" for a dialog process to end the Paro, return national institutions to the control of the government in La Paz, and restore domestic tranquility, the real impetus for the proposals may have originated with Tarija Prefect Mario Cossio. After seeking approval within the CONALDE group -- Spanish acronym for the National Democratic Council, an organizational entity dominated by the Media Luna departments -- Cossio met with Bolivian Vice President Alvaro Garcia Linares in La Paz and negotiated an agreement to end the protest and begin a dialog with the Morales government by the early a.m. hours of Saturday, September 13. UNASUR's announcement of the agreement later in the day represented a major success for the group and offered Evo Morales an opportunity to save face with the Bolivian people given some of the details which the plan included. IDH and royalties. The Government recognizes the right of the departments to receive the IDH [revenue shares]; payment of the Dignity Pension [renta Dignidad] and its sustainability from established funding sources provided by law must be guaranteed. The government also expressed its decision to respect and maintain the current distribution of [oil and gas] royalties to the departments. Autonomies and statutes. The government expresses its respect for the right to autonomy of [the departments of] Pando, Beni, Tarija and Santa Cruz. It also dealt with the new Political Constitution of the State and there will be an institutional settlement for the appointment of vacant congressional seats, the [examination of the] electoral roll, the program of national identity cards and the Civil Registry; [all] the electoral processes will be covered. Dialog. Facilitators and witnesses will be relied upon; those invited are: UNASUR, the Church, the European Union, the OAS, and the UN. Pacification. There is an agreement to the lifting of all blockades and the handing over of public institutions that were taken, moreover there will be a halt to the violence all over the country. Truce. The government will suspend the summoning of a referendum for the text of the constitution for one month; at that time, the deadline could be extended, in accordance with the progress of dialog. There will be no political persecution of the regional leaders and they will investigate the events of Pando. Securing the participation of Catholic Church observers was a key demand of the opposition. The particulars of the above agreement appear at first glance to pronounce a near-complete victory for the Media Luna, but a closer examination of the terms coupled with an expanded knowledge of recent events associated with the Morales presidency makes clear that Evo retained the one thing that is still paramount in his political program; an opportunity to pursue approval of the MAS-authored Oruro Draft of a new constitution for Bolivia. By no means has he received the certain guarantee of a national vote in a constitutionally-legitimate referendum on the document, but he is given the opportunity to put it on the table and there is the larger implication that a meaningful dialog must address the issues associated with the new framework for the Bolivian state, a process that cuts both ways, in light of the specific language in the final clause which mentions "progress" in dialog. From the perspective of the Media Luna, their protest has been justified by the specific statement in the agreement that the Direct Hydrocarbons Tax revenues (IDH in its Spanish acronym) will be distributed to the departments. There is no mention as to the origin of the "right" of the departments to individual shares of the IDH revenues, they derive from a popular referendum passed in a national vote, which now gives it constitutional support; language one must suspect the departments wished to see included. There is instead a general statement from the government that the revenues must be paid to the departments. But even here Morales gets to save face because there is specific language requiring the use of at least some portion of the funds for the payment of the renta Dignidad, which is a pension for seniors Morales wanted to disburse from the national treasury funded by his seizure of the IDH revenues. And furthermore, there is additional language promising the departments their receipt of royalties on oil and gas production, which is a separate matter from the IDH revenues, though this is not recognized as a "right," but rather as the result of a government "decision" instead. There is more than enough real financial gain for the departmental governments in this document to permit them to claim a victory, though by no means can they consider it complete. The "right" of the Media Luna departments to "autonomy" is recognized, but there is no clear identification as to what autonomy means, which leaves the inclusion of the autonomic statutes -- the Media Luna at least got that term in the document -- in doubt, at least in so far as it might entail including them in their current form. For those who have not followed Bolivia closely, be advised that this leaves open the possibility of a redefinition of autonomy that would look very different from what the Media Luna referenda have pursued. Morales has pushed for the restructuring of the internal political processes of departments throughout the country, in his own proposal for "decentralization," which would strip the departmental prefects of their power to appoint numerous provincial "sub-prefects" and thus open the way for a rewriting of local laws within those few areas of the eastern departments where the MAS can gain control. The real purpose of this objective for the MAS is to gain such local control where possible and then open Bolivia's east to "colonization" by western Bolivians in need of land who would receive such grants under Morales's land redistribution proposals. On the surface this sounds quite democratic and socially just, but in practice it means giving land to coca farmers who will expand production of the narcotic-producing crop, bringing all sorts of attendant difficulties along in trail. The Media Luna departments have fought this plan by writing their own laws to prohibit the cultivation of coca -- this was very much at the root of the violent confrontation in Pando, since the MAS activists involved were colonizadores cocaleros -- and Morales intends to use land redistribution to effect a restructuring of political power along with it. "Decentralization" as Morales uses the term only refers to decentralizing the power of the departmental prefects; its actual result would be a much more centralized Bolivian national state, since the prefects have been the only effective check upon the power of the national government. The agreement thus can be viewed as offering both victory and defeat for both sides and its significance for the future remains very much in doubt, given that no final settlement of the outstanding issues has been reached. I think the word "Truce" contained within the published text of the agreement gives us an accurate description of where things stand at present. The IDH revenues must be distributed among the eastern departments, as they demanded, but that only removes an initial obstacle that has prevented Bolivians from getting to the real work of making the political peace. There has been no settlement of the major underlying issues in Bolivian political life, but a breathing space has been created within which the dialog participants might construct one. They still must address Evo Morales's constitutional project and that will not be an easy matter. I have written before that I believe that unless the Oruro Draft for a new constitution is either reworked significantly or scrapped altogether that there will be no internal political peace in Bolivia. I remain convinced this is so today, though I do think something positive has emerged from the conclusion of the Paro, which is quite simply that Evo Morales and the MAS can no longer do their dirty work in the dark. The presence of the international observers at the dialog is in my opinion significant because, especially with respect to UNASUR, they are exercising a public relations role in their pronouncements and media releases on the process that makes it impossible for Evo Morales to present a distorted interpretation of events to the Bolivian people and the world while discounting the differing version coming from the opposition as reflecting some selfish, obstructionist, or vile intent on their part to prevent the realization of the MAS program. The recent public stance UNASUR has taken towards a solution of Bolivia's internal difficulties reflects a dichotomy between an outward expression of support for Evo Morales as the legitimate President of Bolivia and what appears to be a subtle, but noticeable, effort to use dialog to reestablish the institutions of Bolivian democracy within the negotiating process, as the Media Luna desires, rather than as a consequence of negotiations, as Morales has intended with his persistent attempts to force the adoption of the MAS-authored constitution. In its public pronouncements UNASUR has emphasized institucionalidad (institutionality) in Bolivian political life and, in the Latin American political context, this represents a significant change for the country. Institucionalidad means observation of and adherence to the Neoliberal goals of achieving the orderly preservation of domestic political and social stability through laws enforced by competent and legitimate institutions of the state, rather than overthrowing them by popular revolutionary agitation or illegally substituting the rule of a simple majority (popular referenda or single-party legislative sessions) where an absolute majority (two-thirds of the Congress) is required. Morales has repeatedly and contemptuously referred to the "Neoliberal Model" as a failure in speeches to his supporters and public utterances, which goes a long way towards explaining his undermining of the Bolivian Senate and the National Electoral Court, among other institutions, which have stood in the way of his attempts to impose the Oruro Draft document outside the precepts of Bolivian constitutional law. The terms of the agreement to begin dialog specifically state that a means will be negotiated to reestablish the legitimacy of the National Electoral Court and to fill other judicial and legislative vacancies, which obviously was a key opposition demand. It is also worth noting that the role UNASUR has played in reestablishing internal political dialog in Bolivia qualifies the previous effort of Jose Miguel Insulza and the Organization of American States to provide international leadership and support as a failure. The OAS is now only one of several observers to the process, whereas they previously had been considered the principal option for international mediation of the Bolivian political crisis going back to at least last November, when the violence in Sucre associated with the constituent assembly began the downward slide into what eventually became the near civil war of the Paro. Insulza has been criticized for the failure of his organization to provide leadership in the Bolivian crisis, and justifiably so, in my opinion. I have written earlier that he and his organization have undermined the primacy of constitutional law in Bolivia by supporting the settlement of all questions in Bolivia at the ballot box, where the MAS would only need a simple majority to pass its constitution. This would have rubber-stamped their de facto disinstitutionalization of Bolivia's Congress and National Electoral Court, which Morales and the MAS have either ignored or delegitimized over the course of their handling of and participation in the constituent assembly through the end of February of this year. Later, in the late spring and early summer, Insulza attempted to start a dialog process with the Media Luna prefects, but the effort came to naught, as they openly stated that Insulza was in their opinion too close to Morales and Hugo Chavez to earn their trust. Obviously the autonomists paid attention to the OAS's handling of the Colombian incursion across the Ecuadoran border on March 1 to get FARC leader Raul Reyes, as well as Insulza's refusal to open an investigation into the contents of the Reyes laptops after the release of the Interpol report weeks later. The OAS has been a debilitating factor in the Bolivian dialog process to date. And Insulza's tenure as Secretary General has been nothing less than an unmitigated disaster and we can at least in part lay the responsibility for the downward slide into violence in the second week of this month at his feet. Sí -- ¡Yo acuso! Finally; there is the matter of who is not participating in the negotiations, by which I refer to the Bolivian Congress, which is especially important with reference to the Senate, where the opposition holds majority control. In their history of dealing with Morales, the opposition in the Bolivian Congress has shown itself to be inept, incompetent, and perhaps even at times cowardly. The prefects of the eastern departments have been far more politically acute and successful, as they are the ones who led the Paro that has forced Morales to come to the table. If the terms of the agreement are completed in full, then a reconstituted National Electoral Court, coupled with a new and legitimate judiciary capable of enforcing the electoral court's decisions, should emerge from the process. 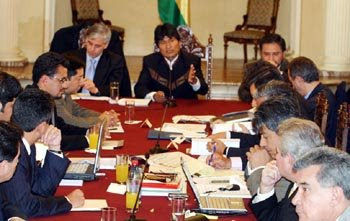 In that event Morales will then have to initiate a dialog with the Congress he has delegitimized because, under current Bolivian constitutional law, he cannot get a national referendum for his constitution unless the Congress calls for one, and opposition leaders in the Senate have recently made clear they will not call for a vote on the Oruro Draft unless changes are made to the document. Morales, and especially his Vice President Alvaro Garcia Linera, have made public statements to the effect that once the dialog with the prefects is completed, the constitution will come up for a vote. If there is anything that can bring the whole process crashing down, it will be a possible attempt by Morales to ignore the role of the Bolivian Congress. And it will be up to the observers in the UNASUR process to guarantee that he does not get away with it if and when he attempts it. The Matrix at the Neocon Express has requested that the following video be circulated in the blogosphere and I am only too happy to oblige. Over the past three days the Paro (i.e. "stoppage") protest underway in the four eastern departments of Bolivia's Media Luna region and Chuquisaca has taken a substantial turn to open conflict with Evo Morales's national government as protestors throughout the region have begun the forceful takeover of the local offices of national government institutions and, perhaps more ominously, some petroleum producing and exporting facilities. Additionally, the Morales government has accused the United States of encouraging what they described as the "divisionist" movement underway in the country's eastern departments and they have expelled American Ambassador Philip Goldberg, thus cutting formal diplomatic relations with the U.S. Almost lost amid the escalating tensions in the eastern departments of the country is the fact that the Morales government backed down from its attempt to convene a national referendum vote on the MAS-authored Oruro Draft of a new constitution by executive decree, which Bolivia's National Electoral Court rejected and even some of his own supporters questioned. All of the five departments engaged in the Paro promised they would not hold the referendum votes if summoned to the polls by any means other than a joint congressional resolution, as required by the Bolivian Constitution, and it looked as though the about-face might open room for dialog between Morales and his opposition. But Morales has since refused in subsequent public statements to accept any dialog on possible amendments to the Oruro Draft and there is now talk circulating that the MAS may attempt another Cerco (siege) of the national congress when it comes up for a vote to submit it, possibly later this month on the 23rd. The head of the police in La Paz has stated that his forces will be prepared to safeguard the legislative precincts of the Plaza Murillo in La Paz that day, but there are doubts remaining as to whether this will suffice in the event the MAS shows up in strength. Beginning last week as isolated incidents which proceeded without much in the way of serious confrontation, pro-autonomy activists in the four departments of Bolivia's Media Luna region have stepped up their pressure upon the national government to restore to the departments the revenues Evo Morales has seized from the collections of the Direct Hydrocarbons Tax with the forcible seizure of numerous local offices of national government institutions. 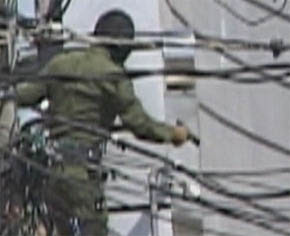 Included among the usual targets have been offices of the National Institute of Agrarian Reform (INRA in its Spanish abbreviation), the National Revenue Service (Bolivia's tax collection bureau), the nationalized telecommunications offices of ENTEL, along with Migration and Customs offices. These seizures have usually been carried out by youth groups such as the Union Juvenil Cruceñista and the Federación Universitaria Local in Santa Cruz, and similar organizations in the departments of Beni, Pando, and Tarija. 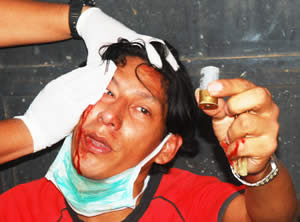 Though the nature of the violence reported in the Bolivian press thus far has not included reports of deaths, there has nonetheless been serious violent confrontation between pro-autonomy activists and members of the national police and, in a few instances, units of the Bolivian armed forces. 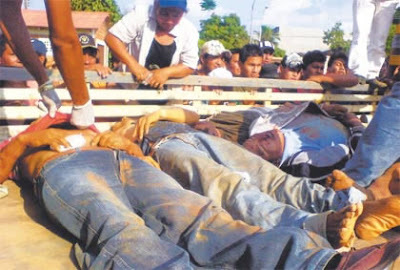 In the city of Tarija, capital of the department of the same name, local civic committee members acting together with university youths seized the customs and migration offices of the national government in separate confrontations with police agents that left a few injured on both sides, though none seriously. In nearby Villamontes a similar scene unfolded with the takeover of the customs and revenue service offices; an action in which a local women's group joined protestors. And there were dynamite explosions reported in the city of Tarija near other offices which were accompanied by a warning from Reynaldo Bayard, President of the Tarija Civic Committee, that "we are going to radicalize measures little by little over the course of the next few hours and days" in the continuation of their mobilization. A protest just yesterday proved the point, as some 50 were injured, including 25 farmers demonstrating against the continuance of the blockade and eight policemen who attempted to halt the collision of a pro-autonomy group who arrived to confront them. 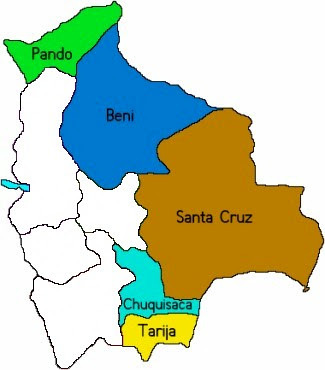 In the Department of Pando, in the extreme northwestern section of the Media Luna, the takeovers of national government offices have also proceeded with an emphasis upon reversing the land use and redistribution policies the Morales government has pushed on behalf of expanding coca production in the entity, an initiative local residents have opposed strongly for what they perceive to be an increase in criminal activity associated with the narcotic-producing crop. Not only have local pro-autonomy activists seized the INRA offices, but departmental Prefect Leopoldo Fernandez has named a replacement for the former head of the agency in the city of Cobija. And among several demands put forth by the protestors, a noticeable one is their plea for the return of a joint task force to combat contraband activity in the department. The Pando protestors have also seized the offices of the Bolivian Highways Administration, Customs, Migration, and the Forestry Superintendency; as well as taking over the local airport, which they encircled and prevented some 85 national police officers sent by the national government from leaving the site on September 5. 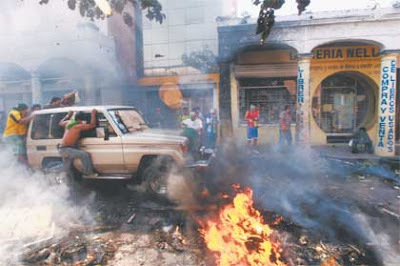 One of the more serious confrontations to date occurred in the city of Trinidad, capital of the Department of Beni, where a violent confrontation between autonomists and military police that lasted for ten hours on September 3rd ended with no result, as the intent of the locals to force the withdrawal of the military did not succeed. The national government has responded by issuing warrants for the arrest of local leaders of the prefecture. But yesterday the confrontations continued, this time with local MAS activists taking to the streets to confront pro-autonomy supporters and over 70 were injured in the ensuing conflict. Events in the Departments of Tarija and Chuquisaca may have more ominous portents for the future course of events surrounding the expansion of the scope of the Paro in Bolivia's east, given that they touch the national economic infrastructure more deeply than the consumer-targeted aims of the stoppage of mass transit embodied in most of the protest's activities. 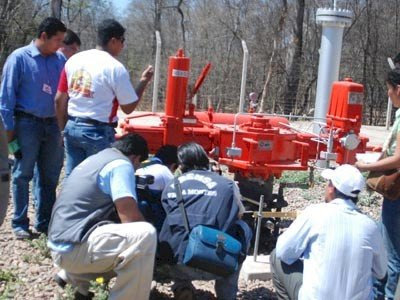 Civic leaders in Tarija, acting with the cooperation of others in Chuquisaca, have seized control of some of the vital pipelines which export natural gas to Argentina and Brazil and have closed them down. Reports indicate that the export of gas to Argentina from the Vuelta Grande field in Chuquisaca, which produces some 83 million cubic feet of gas per day, have ceased after its closure, a development which also impacts supplies destined for Brazil. But news of the seizure and closure of the Villamontes field on the Tarija-Chuquisaca border appears to indicate much more serious actions taken, perhaps by rogue protestors or others. According to one news release, an explosion has destroyed a section of the Yacuiba - Rio Grande gas pipeline which exports some three million cubic meters of gas per day to Brazil and damage estimates for its lost revenues may reach U.S. $8 million per day and repairs may cost U.S. $100 million. 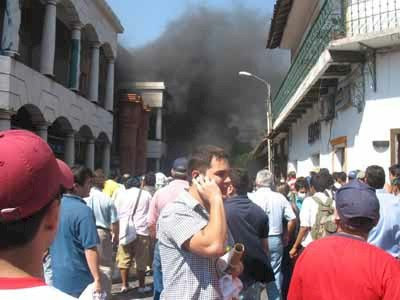 The head of the Tarija Civic Committee Reynaldo Bayard denied that the explosion resulted from activists working with the organized protest and it may be worthwhile to point out that the Civic Committee already had control of the pipeline and had shut it down when the explosion occurred. There seems to be very little anyone outside of Bolivia can do to help calm the situation. As mentioned in a previous post on this site, the Organization of American States has alienated itself from the autonomy protestors by reason of its refusal to recognize the obvious violations of constitutional law on the part of Evo Morales and the MAS that have pushed the protest forward. Tuesday's reaction from the OAS showed no sign of promise for the future as Secretary General Jose Miguel Insulza only condemned the protest and praised the national government for its restraint. It may be that Brazil, which has spoken publicly about the need for the central government in La Paz to come to terms with the autonomy movements, will have to be the first nation to undertake some kind of initiative if there is to be any movement towards a calming of the situation within the country in which outside parties can play a mediating role. It is all spinning out of control. I did not even get into a discussion of the food shortages in La Paz and elsewhere which are demonstrating that the Paro is having a serious effect upon the rest of the country, not to mention the difficulties created within the dissenting departments themselves. Bolivia is quite simply on the verge of civil war and possibly revolution. Unless and until Evo Morales and the MAS come to grips with the necessity of obeisance to constitutional law and its enforcement, there will be no way to get the eastern departments even to begin negotiations. The issues of the seizure/devolution of the IDH tax revenues and the new constitution both reflect the same problem; constitutional law has ceased to exist in Bolivia and the eastern departments are determined to reassert some measure of control over their own destiny in its absence. If this process continues for too long a period of time it will inevitably result in some degree of separation from the remainder of the country, though not necessarily by secession. But between now and then a lot could happen and much of it could portend for tragedy if saner minds do not prevail in La Paz. It may be that the upcoming congressional sessions to consider the submission of the MAS constitution to a possible referendum, perhaps taking place on the 23rd of this month, will give us some idea of the future course of events. If the opposition is permitted to vote in the Senate, Morales's plan will most certainly be defeated. Since we have yet to see any significant action by the Bolivian military to move against the autonomists, it may be that they are holding out for this critical moment when they believe Evo can be brought to his senses by the rejection of his constitutional project. But if that awakening does not take place, or if Evo Morales and the MAS successfully intimidate their opposition once again and use violence to prevent their participation in the legislative process everything could come undone. Bolivia is a very serious situation right now. Is the OAS Undermining Constitutional Law in Bolivia? "One can say a lot about Bolivia, one can write a lot; they can say many things in the press, but the democratic vocation of the Bolivian people never will be written about enough. This is a government that is disposed, as President Evo Morales said, to settle all subjects by the ballot box and not by arms. And it is that everyone who wants to vote is going to vote; everyone who wants to express their opinion is going to express it. . . ."
". . . Understanding is then the only way that Bolivia can come out elegantly, not only for approving its Constitution -which is something so necessary, so good- but also to be able to put limits on inequality, and to be able to have peace and harmony in a society in which all Bolivians can have a place. . . ."
At first glance, Secretary General Insulza appears to speak for the cause of democracy in Latin America and we can view his statement as a policy that deserves our support. But there could be more to his easy generalizations about democracy that we should take into account. It is not so much what Insulza said as what he did not say that should give us pause to look more closely at his statement. Insulza only mentions democracy and elections, he said nothing about constitutional law in Bolivia, and that is a major failing on his part, because the underlying problem that is impelling the current crisis in that country is the total absence of constitutional law, not the security of elections nor the will of the people to accept the results of voting. The central complaint of the four departments of the so-called Media Luna, which were joined recently by the Department of Chuquisaca, is that Evo Morales and the MAS party have governed outside the norms of the Bolivian constitution, especially with respect to their virtual abolition of the power of the Bolivian Senate, which is the principal legislative body in which the five departments have political weight. And what is most disconcerting about these actions on the part of Morales and his government, and which Insulza ignored in his statement, is that they were carried out by means of the exercise of violence and intimidation of their opponents. While there are important ideological differences between Morales and his opponents that are contributing to the tension in Bolivia, the opposition has presented two principal charges against his governance that are of immediate importance, and which refer to the use of the violent intimidation and obstruction of the Bolivian Senate as a means of the achievement of the political program of the MAS. In November, 2007, by means of a surprise maneuver in the Bolivian Congress that required opposition delegates to rush at full speed to the legislative precincts at the Plaza Murillo in La Paz, MAS delegates and their allies began a special and unexpected session to examine their legislation designed to repeal part of the Hydrocarbons Law of 2004. In the original form of this law, which Bolivians approved in a national referendum that same year, producing departments, which include the Media Luna and Chuquisaca, were guaranteed a level of revenues from the Direct Hydrocarbons Tax (IDH in its Spanish abbreviation) equal to the revenues of the non-producing departments of the west of the country, something which the MAS intended to change in order to dedicate these revenues to the renta Dignidad, a pension that would be paid to Bolivians over 60 years of age. But when the opposition delegates arrived, they were denied entry into the special session by a large number of MAS supporters, who surrounded the legislative precincts and used intimidation and some small acts of violence so as to permit only MAS delegates and their allies to participate in the legislative deliberations. The La Paz daily newspaper La Razón reported that the head of the Podemos opposition party, which controls the Bolivian Senate, requested guarantees for the security of their delegates to enter the building and join the special session, which proceeded with only MAS members and their allies present, who voted to approve the legislation. It was not legal and the Constitutional Tribunal of Bolivia, which was already weakened by the resignations of some of its members, was unable to force Morales and the MAS to change course. The second and much more serious charge the opposing departments make against Evo Morales and the MAS for their delegitimization of the Bolivian Senate relates to the violence of the last days of February of this year in the Plaza Murillo in La Paz that is associated with the voting in the Congress on Morales's project for a new constitution, an event now known in the country as El Cerco (the siege). During three days between the 27th and 29th of that month MAS supporters, including many mobilized from labor unions and other organizations known as the Sectores Sociales (Social Sectors), occupied the Plaza Murillo in the center of the seat of government in La Paz, a mobilization begun as a manifestation of political support for Morales and his Political Constitution of the State (CPE by its Spanish abbreviation). But the MAS legislators in the Bolivian Congress transformed the process on the 28th when they moved to present their version of the new charter, commonly known as the Oruro Draft for a new constitution, which the MAS wrote without opposing delegates present in the sessions of the constituent assembly in the department of the same name. Again La Razón informs us of the details of what occurred in the Plaza Murillo during the legislative session of the 28th of February. Though the day began with no more than a few hundred protesters participating in the demonstration, the situation changed in the afternoon. After midday groups of miners began arriving, announcing their presence with dynamite explosions, and later the local capital police, who were present up to this point, were pushed aside and replaced by representatives of the unions who acted as policemen in their place. In the legislature a MAS deputy brought some 50 of the "Ponchos Rojos" -- a farmers organization known for their intimidation of MAS opponents -- into the interior of the building to serve as "Official Deputies," who were joined later by a group of miners accompanied by another MAS deputy and who exercised strict control over the proceedings. The opposing Podemos Party pleaded from the seat of the vice presidency that they not try to pass the constitution by means of an illegal session, but without result. While a Bolivian television audience watched as events unfolded live before their eyes, two female opposition deputies who tried to enter the building were beaten and they were denied the opportunity to participate in the session. Only the delegates and representatives allied with the MAS were permitted to enter and, naturally, in the absence of opposition in the Senate, the Oruro Draft was approved through acts of violence, and moreover it can be said, without legitimacy. The two above-mentioned controversies can be found at the heart of the charges the opposition makes against Evo Morales and his MAS party. 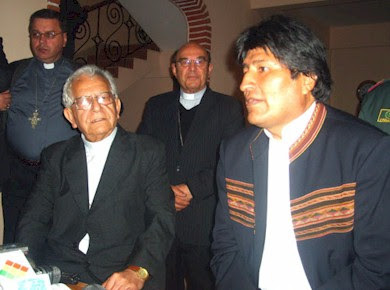 Morales's opponents have presented their case before the Bolivian people and the world as a plea for the invocation of constitutional law in their country. And their argument is easy to understand. If they must accept the results of elections that have awarded the presidency to Evo Morales and have converted the MAS into the prime political force in the country, is it not so that Evo Morales and the MAS must accept the results of those elections for seats in the Chamber of Deputies and especially the Senate that were decided in favor of opposition candidates? The two issues of the refusal of Evo Morales and the MAS to permit opposition delegates to the Congress to participate in the deliberations on modifications to the Hydrocarbons Law of 2004 and the approval of the presentation of the new constitution to the people suggest that it is officialdom that will not accept the results of elections in Bolivia, not their opponents. But there is still more to the actions of Evo Morales and the MAS that confirms the accusation that they intend to abolish the power of the Bolivian Senate, where the opposition can exercise an influence over the country's political process. The Bolivian Constitution requires the approval of the Congress for nominations to the Constitutional Tribunal of the country. As of today, of the five positions on this body, four are unfilled owing to resignations and Evo Morales has not presented new candidates to the Congress to fill these vacancies, because he will have to obtain the approval of the Senate. What has resulted is an institutional vacuum that has permitted Morales to proceed with the restructuring of the Bolivian state, without laws or judicial bodies to restrain his actions. As of this moment, the importance of reinforcing constitutional law in Bolivia grows each day. After the recent revocatory referendums, both Evo Morales and the prefects of the Media Luna believe their positions have been strengthened. The five eastern departments have launched a full-scale shutdown of important transit routes so as to put economic pressure on Morales and his government to return the fiscal revenues of the IDH tax. Evo Morales has responded by throwing constitutional law to the ground once and for all. He now claims that he has the power to convene a national referendum on his constitution by presidential decree and he has fixed December 7 as the date of the voting, while the five eastern departments have pledged they will not recognize the call to go to the polling places that day. This week the National Electoral Court declared that the referendum can only be called by an act of the Congress, a decision Morales has chosen to ignore And without a Constitutional Tribunal to resolve the controversy, chaos does not appear to be very far away for the country. 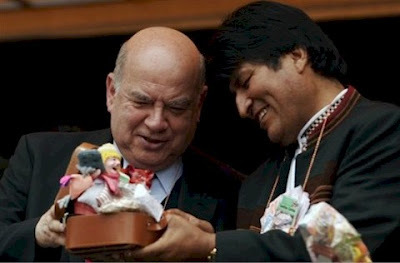 And what does Jose Miguel Insulza offer Bolivians as a means of bringing the crisis to an end through dialog? Nothing more than a statement that does not mention the crisis in the exercise of constitutional law in Bolivia and which instead of that solution opts for an endorsement of the position of Evo Morales -- everything should be submitted to the will of a simple majority of voters. In the absence of constitutional law the exercise of the will of the majority can be converted into tyranny. But the tyranny of the majority is still tyranny. 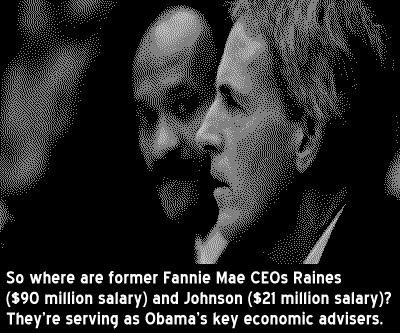 The support for constitutional law, at the very least, apportions a degree of control to this tyranny. But if a people is stripped of their access to constitutional law, they have few other recourses at their disposition to protect their liberties. One of these recourses is the right of revolution. Let us hope that Jose Miguel Insulza learns this lesson with all due speed and that it is manifested in the support of the OAS for constitutional law in Bolivia with the same fervor they show for supporting democracy, because the two are inseparable.